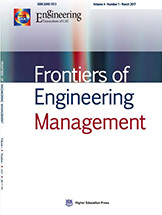 Frontiers of Engineering Management is a research journal sponsored by the Chinese Academy of Engineering, administered jointly by Tsinghua University and Huazhong University of Science and Technology, and published by Higher Education Press, China. The journal is international in its scope and mission. It is published quarterly in English in both print and online versions. Frontiers of Engineering Management provides a high-quality international platform for academic researchers, industry professionals and other constituent communities in the broad field of engineering management to impart and share the latest research results and knowledge in the form of research articles, reviews, and special reports. and in order to boost the development of project management and the progress of engineering management, this special issue aims to utilize new technologies such as big data, artificial intelligence and mobile internet to quickly interact with each other and make more accurate decisions on resource and environment attributes in the entire project management process, which can effectively overcome the traditional disadvantages of the project management model. To submit a manuscript, please visit: https://mc.manuscriptcentral.com/fem, under “Manuscript Type” select “Resource and Environmental Engineering Management and Decision Making”. All manuscripts will be peer-reviewed in accordance with the established policies and procedures of the journal. Papers will be selected for publication following the outcome of the peer review process and subsequent decisions of the Guest Editors and the Editor-in-Chief.